Anyone looking at a globe or worldwide map of Mars can't miss it: the biggest and longest canyon in the solar system. Slicing along the Martian equator for about 4,000 kilometers (2,500 miles), it would reach from New York City to San Francisco if placed in the United States. The canyon floor sinks 11 km (7 mi) below the surrounding plains. That is as deep as some of the deepest parts of the ocean here on Earth. This is Valles Marineris, or Mariner Valley, and its western extension, Noctis Labyrinthus, the Labyrinth of Night. This immense set of interconnected valleys spreads from the height of the Tharsis volcanic bulge eastward until it descends into several channels and chaos terrain regions. It divides naturally into three segments. In the west, Noctis Labyrinthus is made from a network of intersecting closed canyons and depressions. These appear to align with faults in the surrounding plateau. Farther to the east in Noctis, the depressions widen and deepen and become more continuous as they merge to make the main east-west trending canyons of Valles Marineris. Farther toward east, the canyons become shallower, with fluvial features being more common. Eventually, the canyon system disappears into chaotic terrain. Although the canyons show many signs of containing lakes, the canyons themselves are thought to have formed by geologic faulting on a huge scale. The canyons are gigantic grabens. A graben is a piece of crust that drops down between roughly parallel faults on both sides when the crust is under tension. Scientists don't know exactly what started the process, but most suspect the faulting was linked to the increase of volcanic activity in Tharsis. The lakes, probably fed by groundwater, formed layered deposits on the canyon floor in numerous places — Ophir Chasma and Candor Chasma, to name just two. Even the closed depression of Hebes Chasma is largely filled with a giant mesa. Scientists think it was built from material that collapsed in landslides from the walls when Hebes was filled with water. Landslides along the canyon walls were the chief process enlarging the whole canyon system, along with fluvial action from groundwater. The lakes drained eastward, down the regional slope. As they flowed out of the canyons, the escaping water built large flood channels that eventually emptied into the northern lowlands. Earth has no geologic feature matching Valles Marineris. Its closest parallels are with terrestrial rift valleys, such as the one in eastern Africa. This runs southward from the Red Sea through Ethiopia, Kenya, Tanzania into Mozambique. But the East Africa Rift has many active volcanoes, whereas Valles Marineris appears free of them, despite being on the edge of Tharsis. 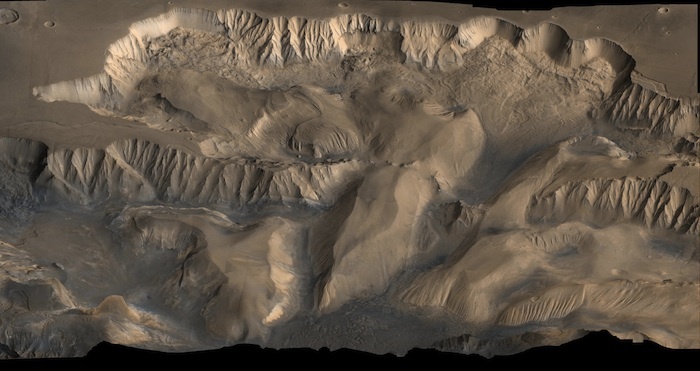 The question of how Valles Marineris was born, took shape, and grew remains only partly solved.